Educators are incensed over this magazine cover. Teachers are outraged with the new cover of Time, and they're taking the magazine to school for it. Time's November 3rd cover which portrays a gavel about to smash an apple along with the text "it's nearly impossible to fire a bad teacher" has angered teacher unions. The American Federation of Teachers has posted a petition on its website asking for an apology. The petition has gained 80,000 signatures since last week, according to an AFT spokesperson. The AFT's complaint is not with Time's story which focuses on teacher's tenure, but rather just its cover. "The articles inside the magazine present more balanced view of the issues," said the online petition. "But for millions of Americans, all they'll see is the cover and a misleading attack on teachers." Time Magazine has responded to the teacher's complaints by opening a forum to those critical of the cover on their own website. Teacher tenure: Good or bad for students? Everyone from AFT president Randi Weingarten to the Badass Teachers Association were able to give their perspectives on the controversial cover. 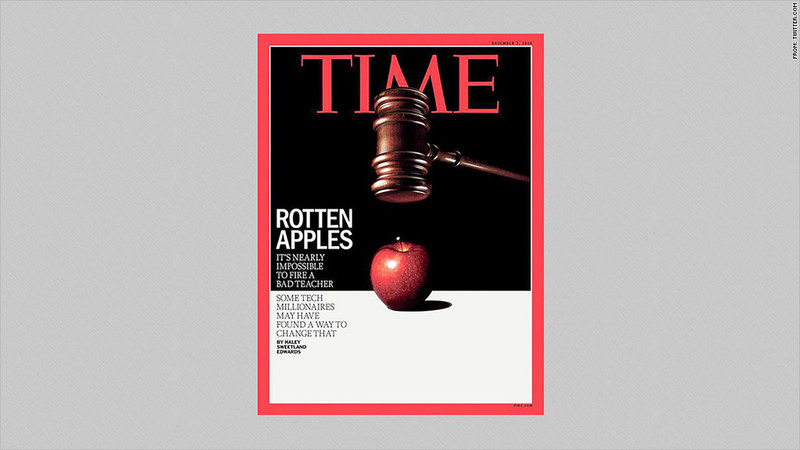 "America's teachers aren't rotten apples, as Time's cover suggests," wrote Weingarten in the forum. "America's teachers are national treasures, doing the most important job in our country." While the cover is new, outrage from teachers over a Time Magazine cover isn't. Back in 2008, teachers were angry with the magazine for its "How To Fix America's Schools" cover. Time did not return phone calls for comment regarding this story.